Eve returns to her fingerstyle lesson series by adding another lesson in her look at the tune "Freight Train". In this lesson you'll learn a new way to interpret the rhythm of the melody. Eve Goldberg brings years of experience, knowledge and passion to her fingerstyle series. Learn the very basics and proceed to more advanced topics with fun, easy-to-digest lessons. To kick off her new Phase 2 Fingerstyle lesson series, Eve Goldberg talks about fingerstyle, why she likes it, artists who play it, and more. Eve Goldebrg talks about the basic principles behind fingerstyle guitar and provides some exercises to get you started. 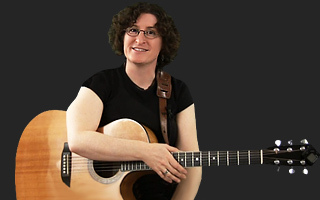 Eve Goldberg presents a lesson to help cement basic fingerstyle techniques using "Skip to My Lou" as a simple practice song. Eve Goldberg continues her discussion on the simple tune "Skip to My Lou" as a way of showing basic fingerstyle techniques. Eve Goldberg concludes "Skip to My Lou" in this lesson by going over the last line of the song. Eve Goldberg spends some time talking about right hand positioning in the first part of this lesson. Then, she moves on to introduce a new song called "Shortnin' Bread." Eve Goldberg continues her discussion of "Shortnin' Bread" in this lesson. Eve Goldberg continues instruction on the song "Shortnin' Bread" in this lesson by taking a look at pattern 2. Eve Goldberg talks about pattern 3 in the song "Shortnin' Bread" then puts it all together. Eve Goldberg continues "Shortnin' Bread" with a lesson on the melody for the verse, or the "B" part of the song. Eve Goldberg introduces the concept of syncopation into "Shortnin' Bread." In this lesson, Eve Goldberg adds syncopation to the melody of "Shortnin' Bread." Eve Goldberg applied syncopation to Pattern 1 in the last lesson. Now, she adds syncopation to Pattern 2. Eve Goldberg revisits "Shortnin' Bread" with a lesson on syncopating Pattern 3. Eve Goldberg takes all 3 patterns and brings them together in the song "Shortnin' Bread." Eve Goldberg explains the most effective way to practice with a metronome. Eve Goldberg continues her discussion on "Shortnin' Bread" and syncopation with a new variation. Eve Goldberg continues teaching the second syncopation variation with a look at pattern two. In this lesson, Eve Goldberg covers pattern three in her second syncopation variation mini-series. Eve Goldberg finishes up the second syncopation variation with a lesson on how to put it all together. Eve Goldberg reviews her third syncopation variation using the song "Shortnin' Bread" as an example. Eve Goldberg continues "Shortnin' Bread" by applying her third syncopation variation to pattern two. In her fingerstyle lesson 23, Eve Goldberg takes a look at the final pattern of syncopation variation three. Eve Goldberg concludes her mini-series on syncopation variation three with a lesson on putting it all together. In lesson 25 of her fingerstyle series, Eve Goldberg adds a brand new syncopation variation to your bag of tricks. Eve Goldberg continues her discussion of the fourth syncopation variation in her fingerstyle series. Eve Goldberg continues her discussion on the fourth syncopation variation with a look at the third pattern. Eve Goldberg concludes her mini-series on syncopation variation four with a lesson on putting it all together. Eve Goldberg takes some time to discuss the possibility of mixing your syncopation patterns together. Doing this will help personalize and add spice to your playing. Eve Goldberg takes a few minutes to discuss some of the trickier parts of reading tablature for fingerstyle guitar. Eve Goldberg is back with a new tune in her fingerstyle series! This time she introduces "Freight Train," a beautiful song you will be learning and using to pick up new techniques in lessons to come. Eve Goldberg continues her discussion on the song "Freight Train" with a close look at the first half of the melody. Eve Goldberg continues "Freight Train" with a lesson on the second half of the melody. Eve Goldberg takes a look at a fun syncopation for the song "Freight Train" in this lesson. Eve Goldberg finishes up the syncopation for "Freight Train" by taking a look at the second part. Now that you've learned the new syncopation pattern and the first part of Freight Train, it's time to apply the pattern to the second half of the tune. In lesson 38, Eve continues her look at the iconic fingerstyle standard "Freight Train." In this lesson she introduces yet another syncopation that you can add to the melody to spice up the tune. In lesson 39 of her fingerstyle series, Eve is taking a look at the second half of "Freight Train" with your most recently learned syncopation rhythm.